Bringing God back into the conversation. Listen Live: Click Here! Every Weekday 7-9AM. 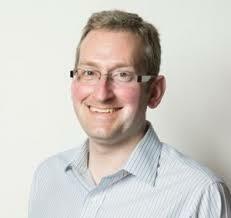 Sam Allberry is a pastor and writer from Maidenhead, UK currently serving at Cedarville University. Sam is a global speaker for Ravi Zacharias International Ministries and an editor, writer and speaker for The Gospel Coalition. He is the author of a number of books on Christian belief, including Why Bother With Church?, James For You, and the bestselling Is God Anti-Gay? Carmen LaBerge: So there’s a lot of times that I talked to authors for whom my encounter with them is a first time conversation and encounter here on the air. That’s not true of this particular conversation partner, of this guest to the program. Sam Allberry is a guy for whom I have prayed, and to whom I have lifted up to God prayers of great thanksgiving. If you don’t already know about Sam or his ministry, check out his website, livingout.org. He’s profiled on the Gospel coalition website. You can find him on Twitter @SamAllberry. And Allberry is like all the berries, all of them, all the fruits, all of the fruit of the spirit evident in the life of one person. So, Sam Allberry. Hey Sam, welcome to Mornings with Carmen. Sam Allberry: Hey, it’s good to be with you. Thanks for having me. Carmen LaBerge: It’s great. It’s great to talk with you. I love this book. And so let’s just begin by dispelling some of the 7 Myths about Singleness. Let’s just dispel with one right away. And that would be that singleness is somehow a curse. We tend to commonly assume that singleness is somehow the absence of all the good stuff. It’s an absence of intimacy. It’s an absence of family. It’s an absence of meaningful ministry. And that’s not true. Singleness in the Bible is really revealed to be a very positive gift and a blessing. So talk with us, dispel the myth that singleness is bad. Sam Allberry: Well, thank you and thank you so much for your prayers by the way. That was very touching to hear. You’re exactly right. The New Testament as it surprises us with how positive it is about singleness. It’s not saying that there are no challenges, but it reminds us that singleness gives us opportunities we wouldn’t have if we weren’t single. Opportunities to serve the Lord. Saint Paul says in 1 Corinthians Chapter Seven that actually, the single person could be undivided in their devotion to Christ. Married people are going to be necessarily pulled in multiple directions even more if children are around as well. But there’s a sense in which the single person has the capacity, has a flexibility that enables, well, what Paul would describe as a more single-minded devotion to the work of the Lord. 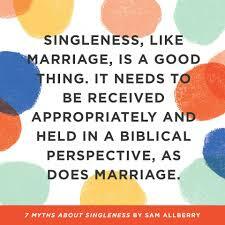 Sam Allberry: And so if we think of singleness primarily in negative terms, we’re not thinking about it biblically. So, that’s one of the key things I think we need to figure out. And as you said, people often assume it’s an absence of intimacy and relationship and family. It really shouldn’t be. But I am aware of the fact that in certain churches, it’s made to be like that. So we do need to work hard in our churches to make sure we’re actually having healthy forms of biblical intimacy and friendship and the church being family and all those sorts of things as well. the positives and we treat them as a way of actually just being self-centered in our singleness and having life just revolve around ourselves and our own needs and our own ones. Whereas all of that flexibility is meant to be harnessed and leveraged for the sake of Christ and his people. So that’s one of the key things, Paul calls singleness a gift in again, in 1 Corinthians seven. So alongside marriage, both are good gifts from God. Both have their own unique challenges. Both have their own way of pointing to the Gospel of Jesus Christ. But both are intrinsically good. Carmen LaBerge: So let’s actually just walk through those because I think that when we use the term intimacy in our culture, we tend to think about one thing or one set of things. We don’t tend to think biblically about intimacy among brothers and sisters in Christ. So if you just talk around the subject of intimacy and friendship and the family of faith and what that’s supposed to look like in terms of relationships, let’s see if we can redeem a little of that. Sam Allberry: Oh, absolutely. It’s a huge issue and it’s such a beautiful issue in Scripture, but I fear we’ve lost touch with so much of what the Bible says on this. So we tend to think in our culture today that intimacy always means sexual intimacy. And so we’ve very much narrowed down our concepts of what intimacy is and looks like. And so it’s hard for us to conceive of intimacy that isn’t ultimately sexual, but the Bible offers much broader categories of intimacy. For us, it speaks of friendship actually as being a very intimate form of relating to someone else. We tend to think of friendship superficially because we’ve downgraded it, precisely because it isn’t the romantic intimacy that we tend to assume as the only kind available to us. Sam Allberry: So friendship for Jesus is spilling all the beans and letting people in on everything that’s going on. That’s not how most of us treat friendship. But if we did treat friendship like that, actually we would be experiencing far more intimacy in our lives, that sense of being truly known, truly loved, truly accepted. That’s the kind of intimacy we should be fostering in our churches. The more we were to do that, I think the more our churches would feel truly like family. Not just a group of people who have some things in common, but actually a sense of really knowing each other and being known by each other. That’s got to be crucial. Carmen LaBerge: I’m so much more that I want to talk about. And so let’s take a quick break and then when we come back, let’s talk about the life of the church and give people some ideas of the ways in which families can serve singles in the church and how helping singles flourish, actually helps the whole body flourish. This is Carmen LaBerge, you’re listening to Mornings with Carmen. 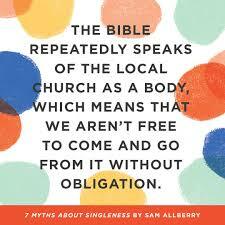 I am talking with Sam Allberry about 7 Myths about Singleness, his newest book. We’ll be right back. 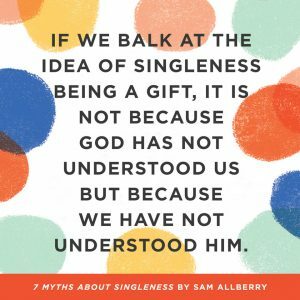 Carmen LaBerge: Returning now in my conversation with Sam Allberry, we are talking about his new book, 7 Myths about Singleness. You can check it out everywhere books are sold. I’m going to encourage you to check out his website as well, Livingout.org and you can follow him on Twitter @SamAllberry, like all berries. Which I know people probably say all the time, but love, joy, peace, patience, kindness, goodness, gentleness and self-control are so evident in your life, and I appreciate that. That’s actually how I remember how to spell your last name with two Ls because you have all the berries. Sam Allberry: Well, I wish I had more of that fruit in my life, but thank you. Carmen LaBerge: Okay, we’re going to return to our conversation about the seven myths of singleness. What are some ways that married couples and families in the church can serve singles in their church? And then how does all of that contribute together to the flourishing of the whole body of Christ? Sam Allberry: Well, thank you for mentioning that and for asking that. Well, several things. We often talk about the church being a family, and we’re right to do so. That’s the kind of primary category that the New Testament gives us, raw local congregations. But we need to make sure if we’re using the language, that we’re actually demonstrating that as a reality. I remember John Stott saying in one of his books that if we’re not actually being family to one another, then we have no business using that language as Christian communities. So we really do need to action that whole category and think, okay, well if we are a family in Christ together, if the blood of Jesus really unites us in a way that’s even tighter than the blood of biology, then that means we need to be including one another in family life, in daily living, doing life together to coin a slightly overused phrase. So I think for families and married couples, it means not treating the nuclear family unit as a self-contained, self-sufficient bubble in which you do life. Sam Allberry: But actually using that, opening it up, involving other people in it and sharing it with other people. And so there should be a lovely, beautiful interplay between our nuclear and biological families on one side and our spiritual Christian family on the other side. And that will be to the blessing of both. It’s great as a single being folded into the life of other families and being able to take a role in helping their kids or whatever it might be. But it’s also a blessing to the family because no two parents are going to be everything that children need them to be. And there are going to be certain points and areas of life where having other worked examples of the Christian faith up close is going to be a massive help to kids to see other worked examples that aren’t just mum and dad. Sam Allberry: And therefore, it’s in everyone’s interests, and that shouldn’t surprise us because if the church is a body, then all the parts need to flourish and we all flourish with each other. So if the singles aren’t flourishing in a local church, that is going to hurt everybody else. Just as I have a stake in the marriages in my church being healthy and strong, so too the married people have a stake in the singles being healthy and vibrant in their singleness. We’re all in this together, so we stand or we fall together. We just need to be mindful of that. I’m also conscious that the category of single people is growing as people tend to marry later, as sadly more and more marriages fail. And as people live longer, there’s a growing demographic of people who are now single in their thirties, but also of people who are single again, after married life. And that can be a huge constituency. Sam Allberry: So singleness isn’t just the twenties, there will be people in our congregations who are single at every age of life and they will be a gift in many ways and they will be people who also need to be served in many ways. So we just need to be mindful and have, I think, close relationships with single people. And for those of us who are single, we need to take the initiative too as well and get alongside again, people of different ages and stages to ourselves. But all of us will be poorer if all of married are in one place and all the singles or in another place. We all need each other. Carmen LaBerge: So Sam, let’s do this. What’s the one thing that you wish your married friends would understand about singleness? Sam Allberry: That’s a great question. Goodness me. I think it would be that actually as a single person, one of the things that happens is our friendships are often asymmetrical. In other words, the married people I’m friends with, often need my friendship less than I need theirs because their primary friendship is their marriage. So I think it would be good for married people just to be aware of that. Particularly, I’ve had a number of single people say that they wish they came first for someone because if all of our friends are married and if most of them have kids, then we’re only going to be fifth or sixth or seventh in there in their list of priorities and rightly so, but that can carry its own pain. And I don’t think that’s something that’s necessarily instinctive or intuitive to people who are married to be aware of. Sam Allberry: So I think the friendships I most value are those that are most attuned to that. And it’s not always me who’s making the initiative, but it’s them as well. And who are just expressing to me that, yes, I’m married, but I still need you in my life, and I still need your friendship. That would be one thing. And I’ve heard Rosaria Butterfield talk about the difference between catch-up-with friendships and do-life-with friendships. And it’s very easy if we were married just to slide into our friendships, only really being people we occasionally catch up with rather than people we are regularly doing life with and seeing frequently. So those would be a couple of things, I think that I’m sure would encourage people who are single. Carmen LaBerge: Well, Sam, you’ve actually awakened me to an awareness about a couple of people who I probably need to initiate more significantly with, who are single and who are catch-up with friends, but who ought to be. And I think very much desire to be do-life-with friends. And so I’m going to take that next step in those relationships and at least invite it. At least invite them in to the total chaos and craziness of our particular family life.make a difference. Sam Allberry: That’s a beautiful thing. So I think one of the mistakes we make is we assume hospitality means having a really presented home life. Either that everything’s tidy and neat and the cooking is amazing, and the kids are all perfectly behaved. But actually, hospitality in the Bible is opening up your real life. And one of the things that I find really honoring and actually quite flattering is when families let me into the chaos. They’re not just giving me the airbrushed version of their family life, but the real version of their family life. They’re entrusting me with the messiness, with the arguments and with everything else. And that’s strange. It makes me feel more at home than when it’s just everyone’s on their best behavior, and it’s all a bit unreal. So that can feel counterintuitive, I think to show someone all the messy chaos of real family life. Sam Allberry: But actually, that’s really honoring because you’re entrusting someone with what you’re really like. Which is, there’s a sense of me that’s been quite vulnerable, but I think the other person will recognize that and will appreciate that. It’s far too easy for us just to show people the Instagrammable version of our lives, and not let people into the reality of our lives, which again, is what intimacy actually is. People who know us not just at our best, but so important to have friends around us who know us at our worst, and who know our family life at its worst and still stick around and love us and encourage us. So I think that would be a great thing. I’m encouraged that you’re thinking along those lines. 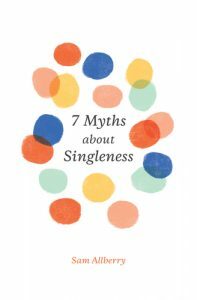 Carmen LaBerge: Sam, thank you so much for your authenticity, for your wisdom and for this new book, the 7 Myths about Singleness. Sam Allberry, thank you for joining us today on Mornings with Carmen. Sam Allberry: Thanks for having me. It’s a pleasure to be with you. Sign up for email updates on how to bring God into the conversation! Reconnect One: What makes Good Friday good and Black Friday black? Get a weekly email from Carmen delivered straight to your inbox! Our mission is to mobilize every Christian to get off the sidelines and into the cultural conversations of the day in ways that honor Jesus.